Looking For The Best Guitar Strap For Electric Guitar? Here’s a look at our favorites, including our top pick – the Ernie Ball Black Polypro Guitar Strap. 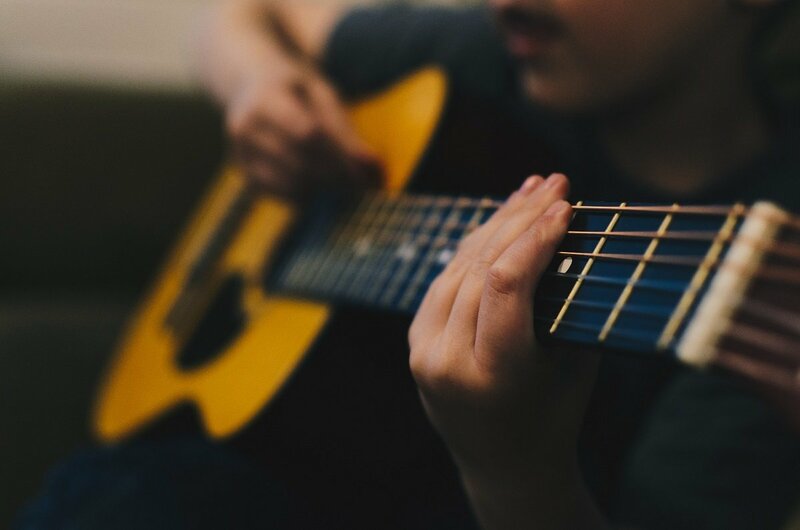 Whether you have been playing guitar for decades or are just getting started, you recognize the value of having the right equipment. 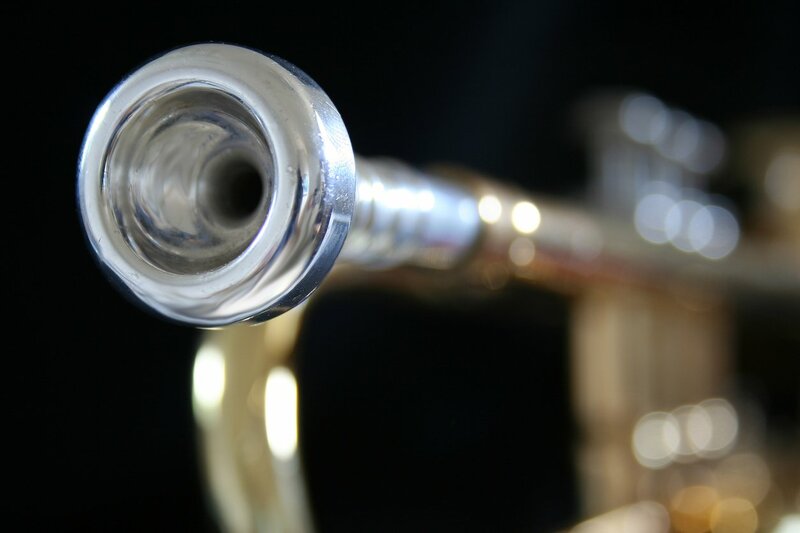 It does not matter if you are taking the stage at the local club, practicing with your friends or playing at a big party, the quality of your instruments, and your accessories can make a huge difference in how you perform and how you are received by your audience. Take the humble guitar strap for instance. 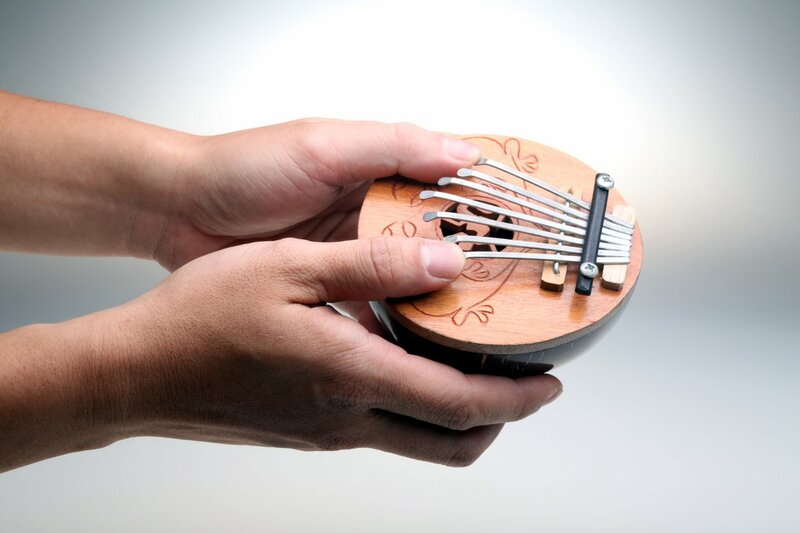 At first glance, it may not seem that the strap would be very important, and it is easy for non-musicians to dismiss it as mere decoration. Experienced guitar players know better, and they understand how the right guitar strap can help them play better and enjoy a more authentic performance experience. Here are some of our favorite guitar straps for players of all ages and abilities. Size: If you are a taller person, you’ll probably want to make sure your electric guitar strap is going to be big enough for your body. Most straps are able to expand to a very large size to accommodate any body size, but it doesn’t hurt to double check before you buy. Durability: Some straps are less durable than others, it’s important to make sure you’re buying a durable guitar strap if you’re planning on using this strap for live gigs or to hold an expensive guitar. Price: For the most part, guitar straps are pretty affordable. Prices can range from $5 if you just want a simple cloth made guitar strap, to $30 and up for real leather and other straps made out of more durable materials. The Ernie Ball Black Polypro Guitar Strap is one of the best looking, and best reviewed, guitar straps on our list. 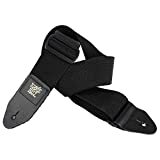 With an average Amazon.com rating of 4.6 out of 5-stars, it is clear that real-world musicians are big fans of this high quality strap. With a list price of less than $9.00, the Ernie Ball Black Polypro Guitar Strap is also one of the most affordable guitar straps on the market, so musicians can afford to buy several and keep them in their gear bags. But despite its low price, the Ernie Ball Black Polypro Guitar Strap also comes with a long list of features, including its durable 2″ wide polypropylene webbing. The strap is adjustable from 36″ to 68″, and the quality construction means the colors will not bleed, and the strap will not stretch out. With so much to recommend it, the Ernie Ball Black Polypro Guitar Strap clearly has a lot to offer. Proudly made in the USA, the Premium Guitar Strap – TANKA is one of the highest quality on our list, and one of the best reviewed. 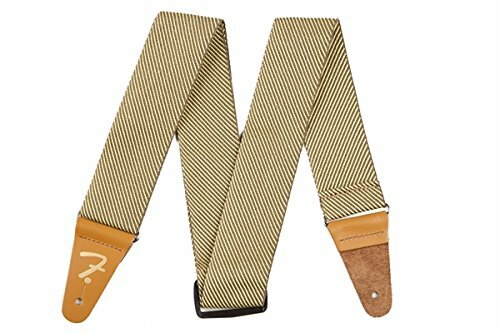 The Premium Guitar Strap – TANKA features an impressive 4.9 out of 5-star rating on Amazon.com, testament to its high quality and durability. Constructed of genuine American bison leather, the Premium Guitar Strap – TANKA is clearly made to last. Its price tag of just under $60, is not cheap, but this guitar strap is clearly one of the highest quality on the market. Instead of going through dozens of lesser quality straps, serious musicians can enjoy years of play with the Premium Guitar Strap – TANKA. The Premium Guitar Strap – TANKA is smooth and buttery soft, with a unique feel and quality that sets it apart from the competition. With its proud American heritage and its top quality construction, the Premium Guitar Strap – TANKA is clearly one of the best on the market. Fender is one of the best names in the world of guitars, so it is only fitting that the Fender 2 Vintage Tweed Strap is a real favorite with amateur and professional musicians alike. With an impressive 4.5 out of 5-star rating by buyers on Amazon.com, the quality of the Fender 2 Vintage Tweed Strap speaks for itself. With a price point of less than $16, the Fender 2 Vintage Tweed Strap also represents an excellent combination of low price and high value, making it one of the best choices on our list. Fully adjustable from 44″ to 49.5″, this great guitar strap is suitable for musicians of all shapes and sizes. This affordable guitar strap also features the classic F logo, a mark all serious musicians will instantly recognize. With an adjustable length of 46″ to 56″ and a neoprene pad for extra comfort, the KLIQ AirCell Guitar Strap for Bass & Electric Guitar is one of the best on the market today. This high quality guitar strap currently sports a rating of 4.7 out of 5-stars among Amazon.com buyers, so it is clear musicians appreciate its style and beauty. With a price of just under $60, the KLIQ AirCell Guitar Strap for Bass & Electric Guitar is one of the most expensive on our list, but its durability and excellent construction makes it one of the best values we have seen. 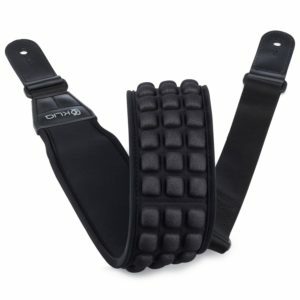 The strap is perfectly balanced, with a 3″ wide neoprene shoulder pad to distribute weight and eliminate discomfort. Musicians who have practiced for hours and performed for hours more will certainly appreciate the comfort, durability and balance the KLIQ AirCell Guitar Strap for Bass & Electric Guitar brings to the market. With an average rating of 4.6 out of 5-stars on Amazon.com, a durable build and quality workmanship, the Levy’s Leathers M8HT-13 2″ Jacquard Weave Hootenanny Guitar Strap offers a lot of features and benefits for a relatively low price of $18. The Levy’s Leathers M8HT-13 2″ Jacquard Weave Hootenanny Guitar Strap has a price point of just under $20, and its long list of features make it one of the best values on our list. 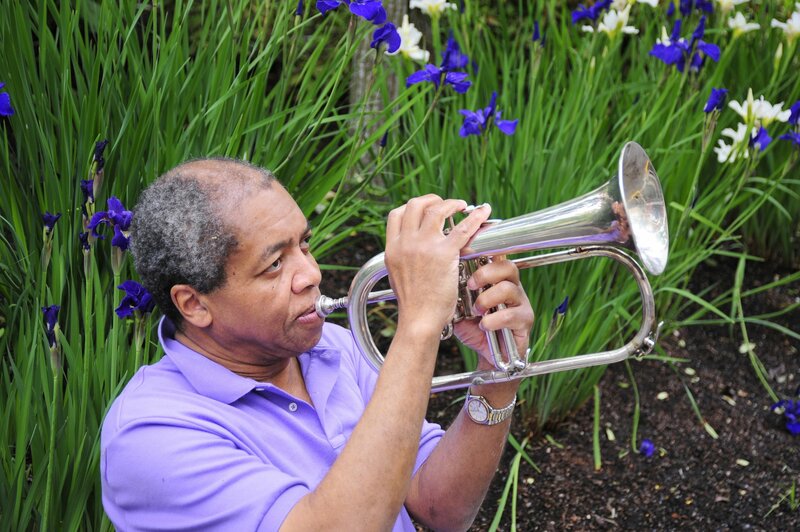 Those features include a fully adjustable strap that goes up to 54″, a stylish gold color, and a comfortable design. 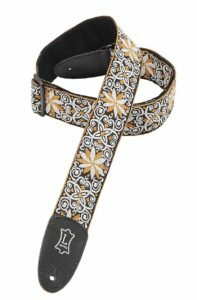 The Levy’s Leathers M8HT-13 2″ Jacquard Weave Hootenanny Guitar Strap features a 2″ wide jacquard weave that brings back the fun of the hootenanny and the excitement of the sixties, and its polypropylene backing and easy slide adjustments make it an excellent choice for players of all ages, abilities and generations. 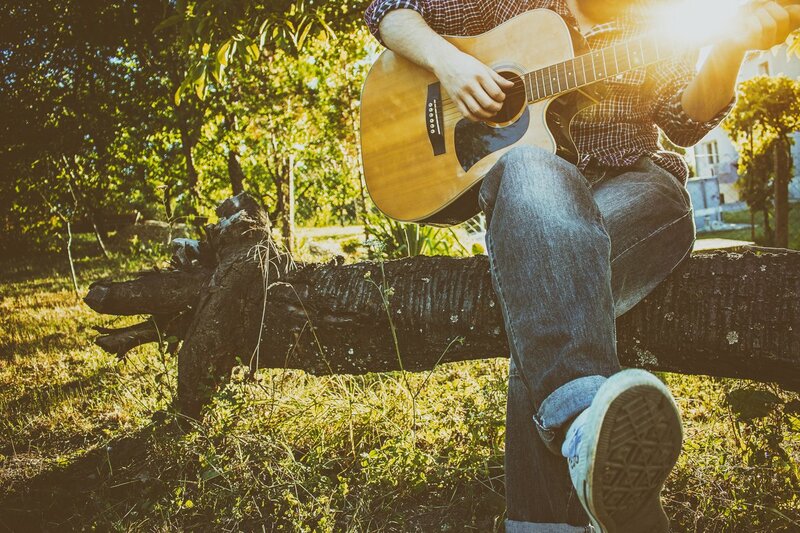 No matter what kind of music you play or where you play it, you rely on your guitar strap more than you might realize. From keeping you comfortable from practice room to stage to holding your instrument in the perfect playing position, the humble strap performs a number of vital functions. 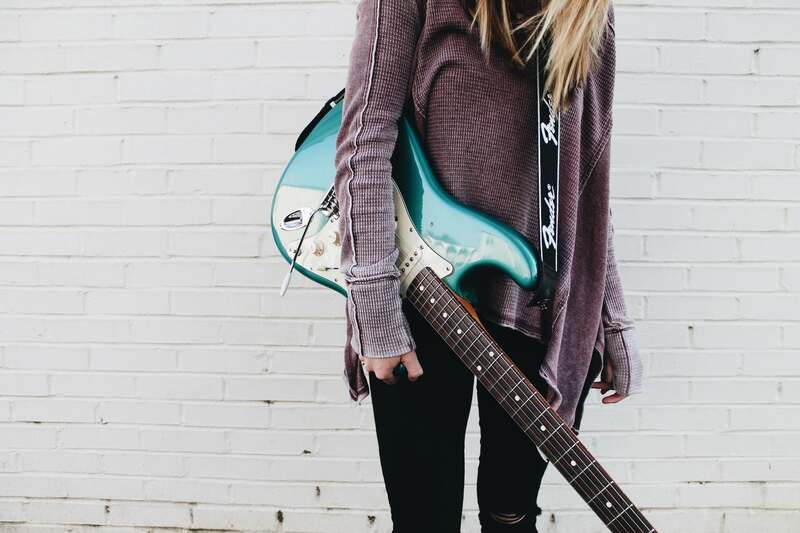 Whether you are buying your first guitar strap or adding to your current musical wardrobe, the items on our list represent an excellent combination of style, affordability and value.